When it starts to get warm, we get asked almost every day “Why is my air conditioner blowing warm air?” There are numerous reason why this could be happening. 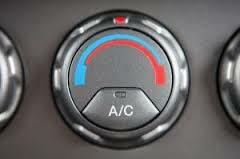 The simplest solution is that your A/C system just needs to be serviced. Most systems need to be serviced every 5 years. What happens is, overtime, condensation builds up inside the system, which causes it to blow warm air instead of cold. When we service the system, we pull all of the refrigerant out and store it, we then pressurize the system to make sure there are no leaks, dry the system, and put your refrigerant back in. Now you will get plenty of cold air. Sometime when we do this we find that there are leaks, and the refrigerant is gone, hence the warm air. If this happens, we need to repair the leak, refill, and you are good to go. Sometimes it’s a part in the system that has failed, usually the compressor, or the condenser, if that is the case, we replace that part, and you are on your way. If your air conditioner is blowing warm air, give us a call, we will set up an appointment for you, and get your A/C blowing nice cool air! Where can I get my vehicle inspected for free? When is it too hot to leave my dog in the car?